Chimps are known for being smart (and even a little intense at times), and a pregnant chimp in Australia is proving that they can also be pretty darn protective, too. Case in point: The chimp, named Zombi, adopted an orphaned baby chimp at the Monarto Zoo after the little guy's mother died in labor over a week ago. And as it turns out, Zombi is doing a fantastic job with the orphaned male, who goes by the name Boon. "From the minute she first cradled the newborn, she's been amazing — grooming, supporting, and nursing the little man as though he was her own," said Monarto Zoo’s primate keeper, Laura Henley, in a statement. Zombi is due to give birth herself later this month, and according to Henley, zookeepers feel optimistic that she’ll be able to care for Boon and her own infant simultaneously. "If any chimp can look after two infants at once, Zombi can," she said. But just in case, the zookeepers at Monarto will be keeping an eye on things. "When the time comes for her to have her own infant, we’ll let nature take its course and only intervene if Zombi appears to be struggling or if the infants require supplementary feeding." If you've wasted countless hours getting lost in a maze of adorable animal videos on YouTube, then you and I are one in the same, my friend. You're also probably semi-aware of the fact that animals lovingly adopting other animals is a thing that happens in the world — and thankfully, we have the Internet to make sure we never forget it. Zombi's adoption of Boon is particularly heartwarming, though, because it's basically never happened before among chimps, according to zoo officials. "I'm humbled by what we've seen from the chimpanzee troop over the last few days — it’s unheard of to see a heavily pregnant chimpanzee adopt an orphaned newborn infant," said Henley. Still, Zombi wasn't the only chimp who helped take care of Boon after his mother's death. 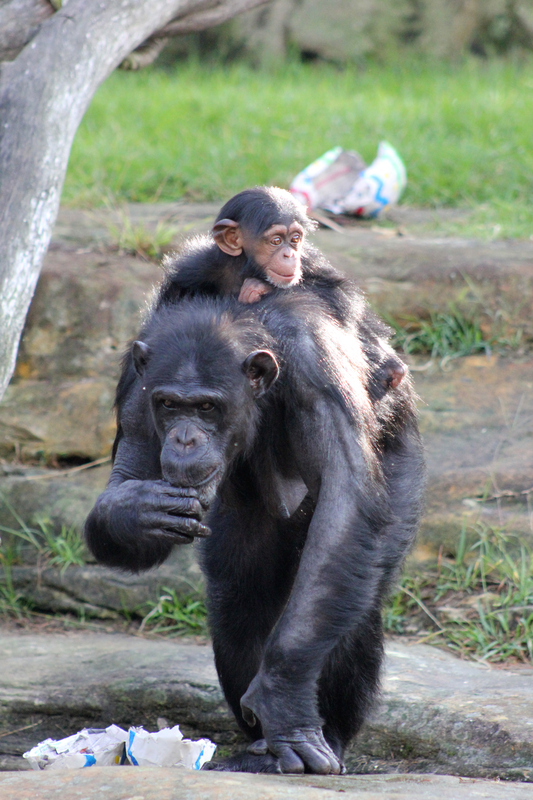 A male chimpanzee named Gombe took care of Boon shortly after he was born, until Zombi stepped in to "adopt" him. And if you're ever in Australia and want to check out the adorable mom-and-baby duo in person, now's the time to do so. According to its Facebook page, the Monarto Zoo Chimpanzee Platform has reopened to the public and visitors, and you can bet Boon and his new mama are attracting a ton of new fans. For now, though — just to make your day even better — I hereby send you on a YouTube journey through more animal adorableness. Here are five times an animal has lovingly taken another one under its wing, and made hearts everywhere instantly melt.